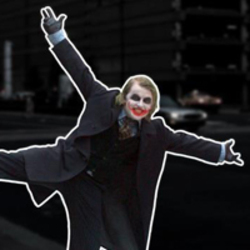 That Joker Guy, aka Toronto Joker, is an avid Joker cosplayer and artist. Always in business for doing art (and occasionally causing some mayhem). Much of his artwork is themed around the ever-popular Batman villain, Joker. And if it's not Joker specifically, then it is either in some form related to Batman, or is an original work. When dressed as his Joker self, he puts his own twist on the iconic character, making him his own. Why copy when you can create?